Martyn does a quick unboxing and overview of the TYT TH-9800. 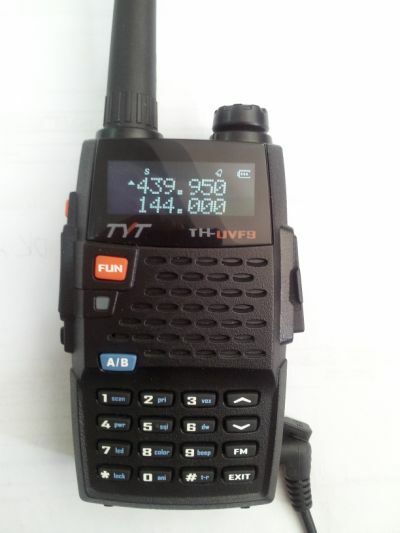 Kight Radio says the TYT TH-9800 is "almost here" and that "100 radios are expected to be released in June." Rumors, perpetuated by me nonetheless, of the death of the TYT TH-9800 may have been greatly exaggerated. 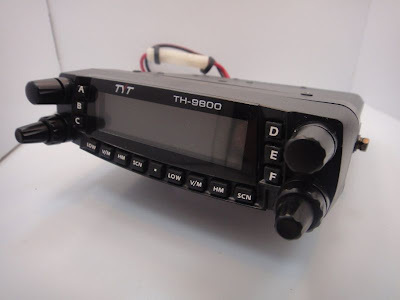 Chris pointed out the Andrews Communications site has the TYT TH-9800 as coming available in March for $399AUD ($416 USD). "My samples for the TH-9800 will ship early April and mass production will begin in May. I'm not sure if they will be ready for sale by Dayton, but I will at least have one on display... I had one on display last year. I have not verified the "optional" VHF ranges but I'm guessing there will be different versions for different countries." I wrote a lot about the TYT TH-9800 in this post last May. In July, Ed was being told that it would be available in October. Dale had thought October as well, but then pushed his date to November. "Apparently the 9800 was shown at Dayton, but it hasn't been put into production yet and probably won't be. At least that's the latest word from a dealer that is a TYT distributor." So more vaporware or just delayed like some other Chinese radios? Wouxun KG-UV920R: Ed Drops A Bomb! Here is the latest news on Chinese dual-band mobile radios. On June 21 I was informed that Wouxun would supply a small number of these radios to selected dealers (max of 10). At that time they also quoted a dealer costs that I thought was outrageous. The dealer costs was almost what I have always considered the retail price would be. In an email I told them sternly that with any dealer markup at all, the radio would not sell in the US and I would decline to purchase samples. Wouxun response was that when full production began, the dealer costs would be lower. Since I've invested hundreds of thousands of dollars building a market for this company over the past few years, I decided I would not let others bring this radio to market before I did. I reluctantly placed an order for 10 radios, figuring I would sell them at costs, to get them to market. After my order was shipped, Wouxun informed me that these sample radios must NOT be sold for less than $320-$330. They went on to say "If we found you or your dealer's end price was lower this range without our permission in advance, then we will stop supplying this model to you." For the past two years, I've repeatedly told Wouxun that this radio must sell for no more than $250-$275 for it to be competitive with the big three Japanese companies. It appears this advice has fallen on deaf ears. These pre-production radios lack some of the features the full-production radios will have. These will not be FCC Certified for Part 90 use. They will have narrow band capability but will not have the 2.5 kHz tuning step required for Part 90 radios beginning in 2013. The frequency range will be RX:136-174 & 350-480 and TX: 136-174 & 400-480. They did not indicate if any wide-band receive, such as 118 MHz AM, would be available on these pre-production models. Although these radios may lack some of the bells and whistles we've expected, I imagine they will still be good dual band radios for the ham market. BUT, I still don't feel they are worth $325. Wouxun says I can't sell these for less than $325. They did not say that I can not include a FREE HT with the purchase. (Rest assured, they will raise holy crap about it, but I'm used to that) So here's my plan. I will place the limited number I have on sale for $350 and include a free KG-UV2D HT in the deal. I'll profit nothing at this but we'll see what happens. For the past two years, I have consulted with Anytone as they developed their dual band mobile radio. Anytone send a non-working model of the radio for me to show at the Dayton Hamvention (Wouxun would not send anything). Anytone is now sending a working model (for free!) and says full production will begin in early August. Anytone has quoted a price that lets me know this radio will retail in the $250-$275 range. It will be Part 90 Certified and will have some wide-band receive ranges, including AM aircraft. I look forward to working with this company and expect their mobile to be a big seller. This radio covers 10 meters, 6 meters, 2 meters and 440 (only FM mode). TYT sent a semi-working model for me to show at Dayton. It would light up with menus working and etc. Those who played with the display said it is a clone of the Yaesu FT-8900. I have a close contact at TYT and am told they are working hard to get this radio into production in October. I will continue to do my best to bring quality made Chinese radios to the US market and will only send these emails when necessary. This particular email is going to about 5,000 people so please don't expect a quick response if you send me a question. My shooting from the hip response... Ed is fed up enough with Wouxun that he is will to stress the relationship, but he's not done that without a Plan B (name change to Import Communications, Baofeng, Anytone, TYT). It also makes me think that Wouxun may have done us a great service by leading the way, but they may price themselves out of the low cost market - then they will be competing with the big boys on performance and quality. I'm sure the message board will be hopping tonight. I'm going to bed, but there will be interesting reading in the morning I am sure! I'm gonna have to read up on the AT-588UV, too. I think the problem is even worse than calling the "Quad" a "Dual" when you have a single band version, too - all under the TH-9800 model. "I would like to make something clear. Someone is posting on groups that the TH-9800 at Dayton was a dummy non working model. This is not true. The TH-9800 at Dayton was a fully operating unit and it was plugged in at Dayton so people could play with it. This sale person is posting that it is a Dual Band mobile and not a Quad Band mobile. That is also not true. 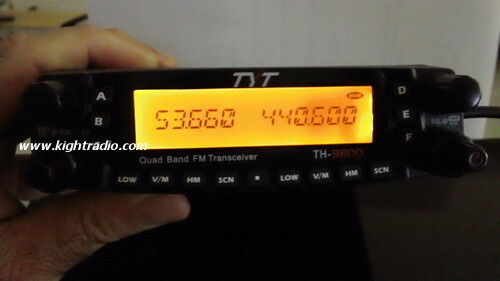 The unit is Quad Band however on the sales information, TYT calls it a Dual Band. I have talked with them many times about them calling it Dual Band and telling them they should call it a Quad Band but they just do not understand. I then put alot of thought to that and I have backed off in trying them to change it to Quad Band. If they realized it as a Quad Band and different then the others that will come out, that might cause them to raise the starting price so I have backed off with hopes of a lower starting price. On the catalog page of the TH-9800 on this site, I posted actual pictures of the TH-9800 I had just before returning to TYT." The Kight Rado photos are below. I'm finally getting around to doing a real post about the TYT TH-9800. First, I do not see it listed on the TYT website. 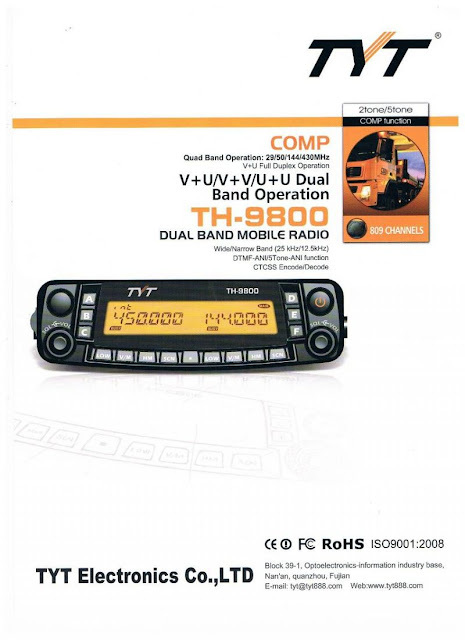 The KC2RA site posted some info about the TH-9800 when they did the review of Chinese mobiles. Kight Radio does have it listed, but labels the radio as a dual band mobile. It hints at a surprise and suggests reviewing the spec sheet where the frequency ranges are 28.000 - 29.700, 50.000 - 54.000, 144.000 - 148.000, 430.000 - 450.000. Also, on the 25 MAY 2012 update from Kight Radio, they report the TH-9800 will also have "AM Reecieve on the Aircraft band." 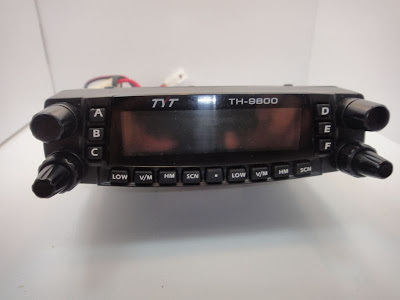 Andrews Communications Systems has the TH-9800 listed on their site with an expected price of less than $499 AUD/$485 USD. Given a price in that ballpark and the quad band capabilities, this would not appear to be a direct competitor to the KG-UV920R. This picture on the Andrews site doesn't look anything like the others below. 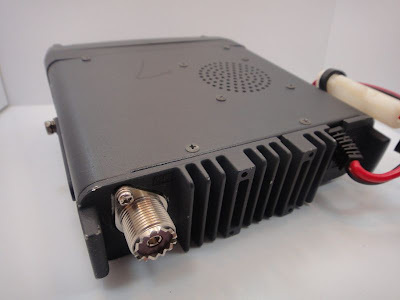 "Re the Quad Band mobile transceiver, this is still under development, a dummy rig was seen at Dayton, Sam (from TYT China) let one float around, this will be an exciting rig and a good price but it is not going to be available until very late in the year if at all this year." Earlier in the month, Nate pointed out in the comments that there could be some photoshop action going on in the TYT TH-9800 Dual/Quad band - a Yaesu FT-8800R screen? It doesn't mean the radio is fake by any stretch as I can image the marketing designer grabbing something convenient to complete the image. For what might be the single band versions of these radios, there is already Type 90 acceptance by the FCC (ID: X24-MOBILE-V). Again back to the pictures, nothing matches so I don't know what to expect. This is the picture that is linked to the TH-9800VHF documents on the FCC site. I've copied the features list from Sparky's blog here. He mentions a price of $375 - $450 USD and says it will be available "Winter 2012." I'm not sure of his source, so I am leaning towards Kight's price and date, since he talks about going to China and seeing the various manufacturers and sellers. Brilliant crossmodulation, intermodulation rejection and strong signal performance – similar to commercial radios! For the quad-bander, two antenna connections makes a lot more sense. Given the lessons of the KG-UV920R, I'm not going to hold my breath for this one either.